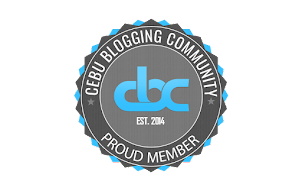 I really do not consider myself a coffee person, but lately I have been discovering new things about the world of coffee with the help of the different coffee enthusiasts here in Cebu. After my introduction to the 3rd wave of coffee, when I visited Ironbound Coffee and Bakery, I got a text from the owner of Boots Coffee Bar. He told me to try his coffee. Boots Coffee Bar is located at the Al Fresco area of Persian Palate in Mango Avenue. It is only open during Fridays and Saturdays. Last weekend, I checked it out. 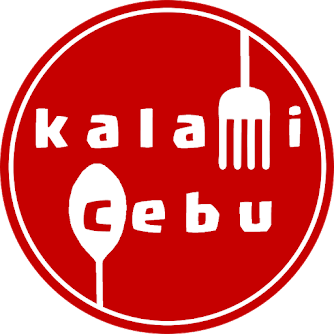 Boots Coffee Bar features Kalinga Philippine Coffee and Civet Coffee. Kalinga is located in Northern Luzon and it is a hotbed of organic coffee producers. Kalinga Coffee has been gaining popularity and acclaim in recent years here and abroad. At Boots Coffe Bar, you can have their coffee in 3 unique brewing methods. Drinkers can choose between V60, French Press, and Vietnamese Phin. Based on their menu, the V60 produces a smooth cup, the French Press will have a bright crisp cup, while Phin will give a strong cup. I asked for a recommendation from Magin, Boots Coffee Bar's barista extraordinaire and she told me that I should try the Kalinga Coffee V60. I told her to make me one. 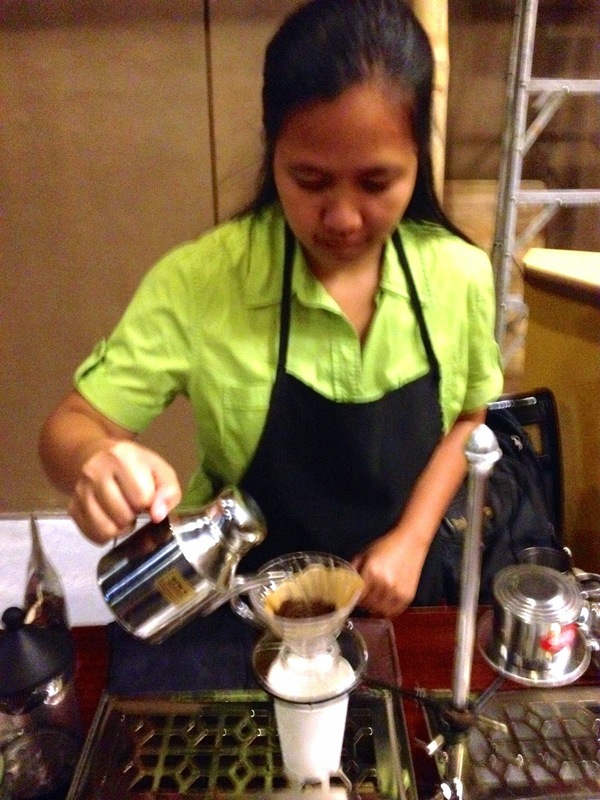 Here is how she made a Kalinga Coffee using the V60. 2. Pour the ground coffee into the V60 dripper that has a coffee filter that has been rinsed with hot water. 3. 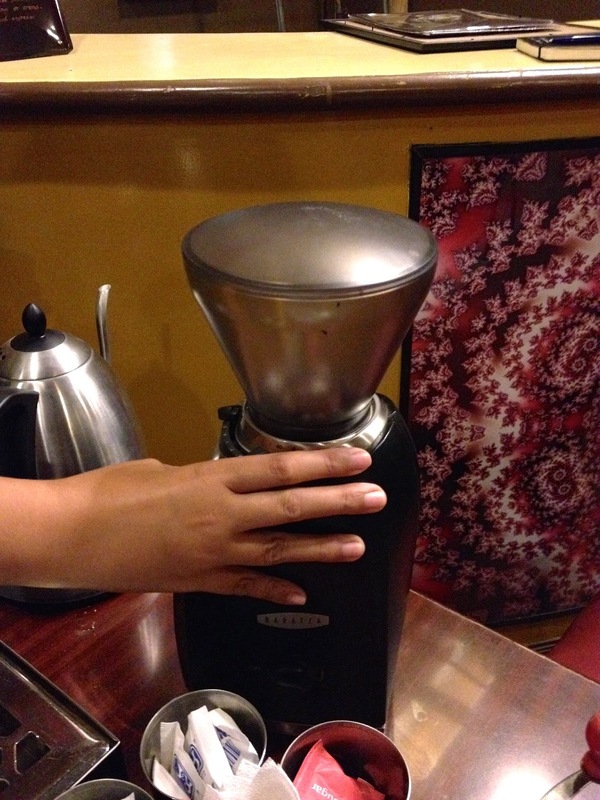 Gently shake the dripper to make the coffee settle in the filter then create a half-inch "dimple" using a finger. 4. Slowly pour just enough hot water to wet the coffee beans. Let the coffee absorb the water. 5. Let the coffee "bloom" for a few seconds. The hot water releases trapped gasses and you can smell the beautiful aroma of the Kalinga Coffee. 6. After the blooming, pour water in small circles around the center of the dripper. Let the coffee drip into the cup then serve to the customer. The whole process took around 2:30 seconds. Magin told me that it is sort of a precise process and she even showed me that she uses a timer to keep track of the V60 Brewing process. For probably the first time in my life, I drank a cup of coffee without any sugar or creamer. 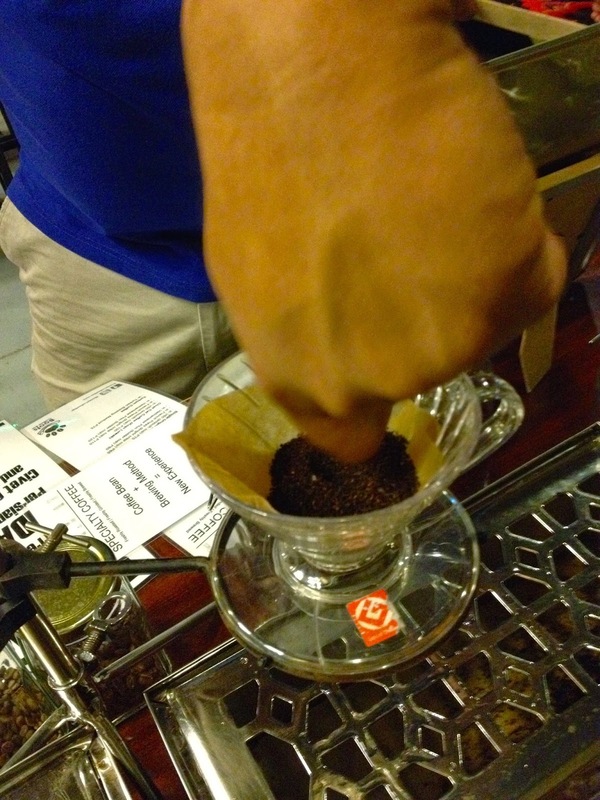 I was pleasantly surprised as the Kalinga Coffee + V60 Brew produced the promised smooth cup. The cup gave a very fresh and earthy aroma. It was very mild and it does not have the usual acidic flavor that lingers in your mouth. The bitterness that is associated with the coffee flavor subsides in just a few seconds producing a very smooth finish. 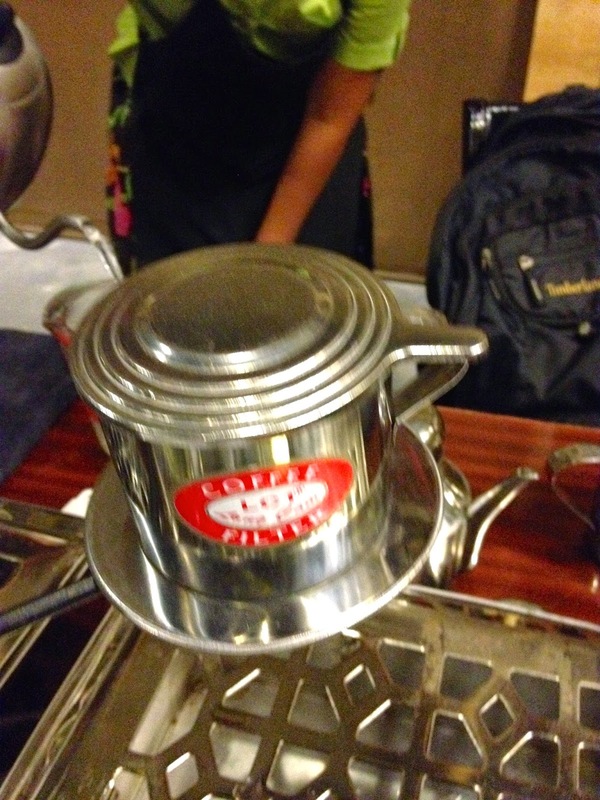 I also tried the more expensive Civet Coffee + French Press. The Civet coffee is also produced in Kalinga. The difference is that the coffee beans are eaten by Civet Cat or locally known as Musang and the droppings are then washed and processed into coffee. Civet Coffee is considered to be one of the rarest gourmet coffee in the world. Compared to the V60, the french press uses a coarser grind of coffee. The French Press steeping took around 4 minutes. The aromatics of my second cup was quite similar with the first cup that I tried as they come from the same area. There was a bit of acidity, but it was just enough to stimulate your tongue. Just like the first cup, it was not as bitter as expected. 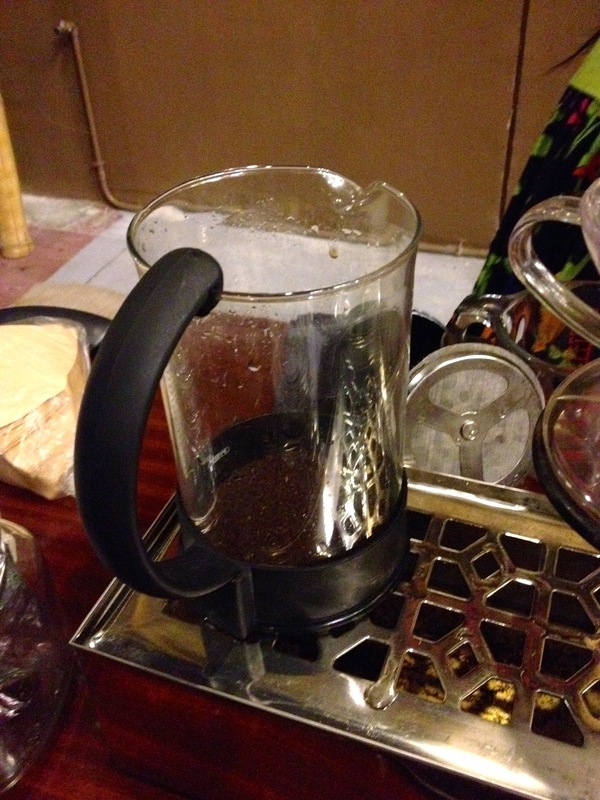 My Civet Coffee + French Press was just slightly more robust than the Kalinga Coffee + V60 Brew. I was able to finish it without the need to add sugar or creamer. I did not try the Vietnamese Phin anymore because I felt that I reached my caffeine limit for the day. According to Magin, the Phin will produce the strongest brew among their 3 featured methods. I really loved my experience there. All in all, I paid 185 for the 2 cups and it was well worth it. I could see that people behind Boots Coffee Bar are really into coffee. Magin was so passionate about their coffee and she really answered my questions, even the most unusual ones. I even received a text from Boots a day later and I could sense that he was as passionate as his barista because he really reiterated all points made by Magin. I love it when baristas or cooks explain their creations to me. 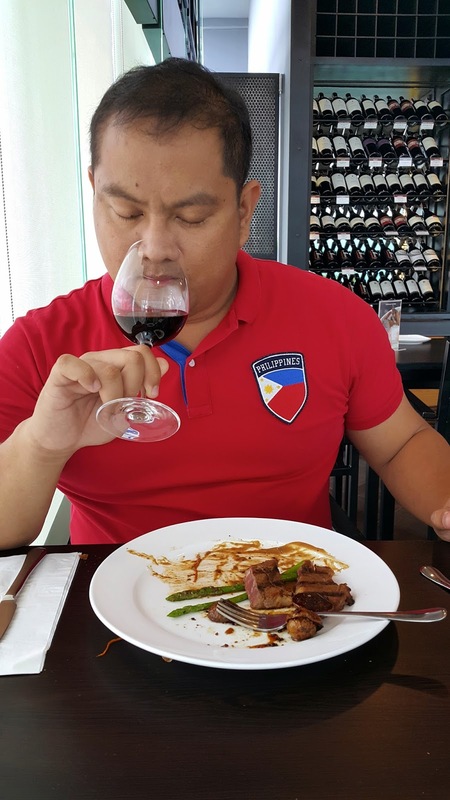 I always believe that the best coffee and food is made with love and talking about it somehow enhances the flavor and the whole dining or drinking experience. If you love coffee, I really recommend that you try the different coffee creations at Boots Coffee Bar. Kalinga coffee is a revelation and Filipinos should patronize and be proud about it. A lot of classy and expensive coffee shops are thriving in the city, but most of the time people take for granted the flavor and the brewing process, yet they pay over 100 pesos for a cup. It is refreshing to know that there are a few people, who are advancing the cause of our local coffee farmers and I am impressed with their dedication. Give Kalinga Coffee a try and be pleasantly surprised.